fried: It just becomes soft and luscious. Photo by Elvira Kalviste | THE NIBBLE. 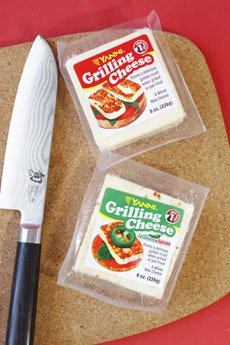 If you’re trying to cut back on cheese, don’t buy Yanni Grilling Cheese from Karoun Dairies. It’s addictive, and you’ll be back at the store the next day to buy more—much more. This oh-so-delicious comfort food can be baked, grilled, microwaved or pan-fried. It’s made for grilling without melting. Karoun makes original and jalapeño flavors. The jalapeño is only mildly spicy and provides an excellent counterpoint to the creamy cheese. In fact, we find ourselves adding a pinch of crushed chili flakes to the original variety. You won’t run out of ways to serve yanni, from appetizers and salads to burgers and grilled cheese sandwiches. Check out the full review, which includes our favorite uses, this week’s recipe and cooking video on how to make the perfect grilled cheese sandwich. Prepare to discover a new favorite comfort food. Find more of our favorite cheese reviews and recipes.